1-SOLDAT possesses good speed, an inside post, fitness, a win over the track and a trainer that wants to win. BET(S): $100 to WIN on 1. For the fun of it, Anthony has also put together a $216 ticket (before scratches — if any) for those chasing the $203,977 Classix carryover at Oaklawn Park on Friday (2/25). This ticket will NOT be included in Anthony’s Challenge stats. COMMENTS: SPECIAL KID and FUSA CODE seem to be the class of the field based on the groups they have been facing. However, the former came out of a maiden win and the latter is still a maiden. Therefore, IT'S MY PARTY is the pick. His best speed figure is the best in here; only 2 BRIS points below the par. Also, trainer Chris Hartman is the man in Sunland Park — very effective and a great combo with the jockey. This is a consistent colt with affinity for the track. COMMENTS: INDIAN WINTER had a legitimate chance in the San Vicente from a handicapping standpoint, therefore, he is the best bet on the Turf Paradise card. He has the best figures and great pedigree for the distance. Trainer Jerry Hollendorfer is a great shipper and very effective with first-time routers and with horses competing in non-graded stakes. THE GREAT CAPER is dangerous at the price. It switches to a higher % trainer who has been very hot in the last 14 days. The Great Caper’s latest workout was good and he could be ready to fire. BET(S): $20 WIN on 1 and $10 PLACE on 8. $2 Exacta Box 1,8 with 1,3,7,8. COMMENTS: From a handicapping standpoint, EVENING JEWEL and UNZIP ME are the best in here — the class of the field. However, I will take a chance with Bran Jammas at a price. I liked her last time, when she was off slowly from the gate and then saved ground. In that race, she repeated her best speed figure (91, Evening Jewel's best is 94 on the lawn). This is her third start off of a layoff (her trainer has a 10% ROI with this angle) and she should be ready to record a lifetime-best BRIS figure. She has a sharp workout for this one, showing that the trip to Finger Lakes did not hurt and she switches to Garret Gomez. BET(S): $10 WIN on 5. COMMENTS: I really think Dancinginherdreams is the best filly out there. She is something special and looks very fit for this one coming off a bullet work. She is expected to improve in her second start following a layoff. However, from a handicapping standpoint, Oh Carole is a super value play. She ran the same day (in the 2nd race) as the Forward Gal (the last race of most of the best fillies here). The fractions for the 2nd race that day were :22.1, :45 and 1:09.2 and the final time was 1:15.3. The fractions for the Forward Gal were :22.1, :44.3, 1:09.1 and the final time was 1:22.4. The BRIS figure for Oh Carole was 103 and for Pomeroys Pistol it was 95. In my book, this is VALUE. She is undefeated and eligible to improve with a patient and intelligent jockey. COMMENTS: Travelin Man could be something special, at least sprinting. His speed figure in his debut was amazing. However, I will stay in the bandwagon of Leave of Absence in his 3rd off the layoff and 1st time blinkers. He comes off of a bullet drill and Maragh sticks with him. His price will be awesome. We have a lot of speed here and my pick may enjoy a nice stalking trip outside the speed. 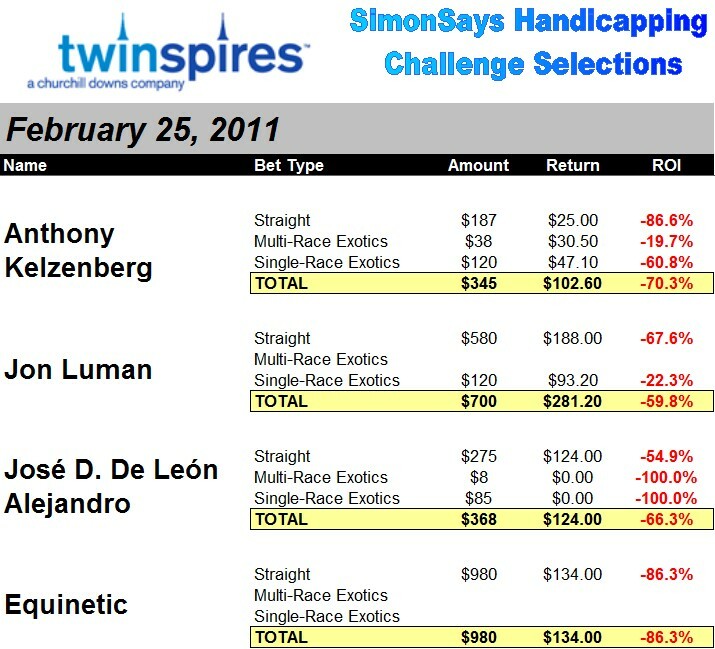 Before the Spectacular Bid Stakes, Derek Simon considered Leave of Absence “one of the few” in that field that “could have a say on the Triple Crown trail.” The race produced a long shot and he was second in a bad handicapping race. He returned in the Holy Bull, but was squeezed back early and never recovered. The blinkers will be the difference here. COMMENTS: To Honor and Serve tops my early list of preferred colts that hope to be Derby bound. He is going to crush this field. I'm going to try to take advantage of the extra Saturday competition by going to the exacta. Rationale: If 10-Royal Currier, looks sharp on Saturday, I'll be tempted for a win bet here. With the outside post, he might be able to cruise to a position without fighting for it. Rationale: If I were betting to win, I'd be inclined to back 7-To Honor and Serve; he has the best rating here, and could romp if not pushed early. Here are my pick-4 plays for Friday and Saturday with some brief comments regarding strategy. $1 PICK FOUR 1,4,5,9 with 9 with ALL with 1 ($40) & $0.20 PICK FOUR ALL with 9 with ALL with 1 ($20). COMMENTS: A co-worker of mine owns the 9-horse in race 5 (Dakota Noc) and was supremely confident regarding his chances today. The #1 in race 7 (Goodbadandugly N) had a tough first-over tightener after missing 5 weeks — looks good in here. $1 PICK FOUR 2,5,6 with 9 with all with 6,7 ($42). COMMENTS: The 9-horse in the 11th backed up slightly on a night where closers were winning EVERYTHING. Double J guns him out here. 6,7 in 13th dropping big-time and look best. $10 PICK FOUR 5 with 2,3,7 with 4 with 1,2,4 ($90). COMMENTS: If you have access to PPs for Fraser, check out the #5 in the 6th — improved SEVEN seconds in three weeks off a claim by Eddie Hensley. $1 PICK FOUR 1,6,9,10 with 3,4,5,6,7 with 6,7,10 with 9 ($60). COMMENTS: #9 in race 7 (Celebrity Cowboy) looks much the best with the class drop; hoping to hook him up with a price or two. $0.20 PICK FOUR 8 with ALL with 1,3,5,6,8 with 5,6,7,8 ($40). COMMENTS: 8-Winter Blues makes third start for the Montini Barn without much to beat; looking for bombs in the other legs.